One of the leading Russian media outlets “Literaturnaya Gazeta” published an article of Alexander Tsuganov, Russian writer and the Chairman of the Writers’ Union in Volgograd. The article is devoted to Azerbaijan. Eurasia Diary shares the article with its audience. On September 27, the leaders of the Russian Federation and the Republic of Azerbaijan attended the 9th Russia-Azerbaijan Interregional Forum that was held in Baku. 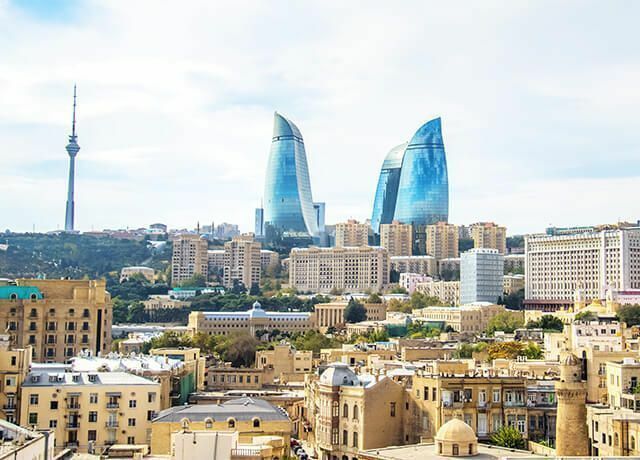 In Azerbaijan, there are more than 700 jointly work companies. Russia exports agricultural products, cars, equipment, as well as products for the chemical industry, metals and wood to Azerbaijan, and at the same time, it imports goods, textile products and metals from Azerbaijan. Approximately 341 Russian-language secondary schools operate in Azerbaijan. But somehow it happened that we know more about New York or Paris, and remember about Baku only when we buy tomatoes, potato or sweets like pakhlava. So, how do our neighbors live? We are going along the Caspian Sea. A dark brown landscape surrounded by cliffs of the Caucasus Mountains is visible from the window. As it is in the Zavolzhskaya steppe, the sun dries everything here and flora disappears. On the left side, there are huge stones and traffic signs lead to the Gobustan. A lot of academic articles were written about Gobustan and its pictures of the people from Paleolithic era depicted on the stones. Petroglyphs – the messages of ancient ancestors resemble children’s drawings. It is an interesting sight, especially for those who haven’t been in Karelia and who did not see a huge reserve with rock paintings there. The bus goes up to where there are bigger stones. You can see oil drilling rigs, bushes and the burning sun over the Caspian Sea. “Baku was established on the place like this,” the guide says. It is hard to believe. There are many parks, greenery, fountains and botanical gardens in Baku. Even the graveyard where famous musicians including Muslim Magomayev, writers, and politicians were buried looks like a park with rare thoroughly paths. But the main diamond in the architectural appearance of the city is the ultramodern building of the Heydar Aliyev Cultural Center. White unusual creation of the Iraqi-British architect Zaha Hadid, with smooth rounds of a graceful huge cockleshell. The Flame Towers, 120-160 meters-high buildings which symbolize a fire, take the second place in terms of architectural prospects. This shamrock is original not only for its height, but also for its unusual lining in the form of LED screens that reflect the movement of fire and creates a visual effect of a gigantic flame. According to many specialists in urbanistics, the lighting of the “Flame Towers” is recognized as the best in world practice. The young architects from Volgograd and those who have visited many cities and countries, are scattered around viewing platforms and are trying to capture their delight with the help of cameras. Below is the uncovered winding ribbon of a modern, well-groomed embankment with a variety of rides, cafes and restaurants. It has its own “Small Venice” with gondolas brought from Italy, a unique building of a carpet center, an elite restaurant in the form of white lotus on the water and, of course, oil rocking. It is also a symbol of the city, like the smell of fuel oil. The old part of the city is called Icheri Sheher which is listed in the UNESCO World Heritage Site. On these ancient narrow streets, scenes of several Soviet films have been filmed. There is also an abundance of food and souvenir shops. The architectural appearance of the cities and the quality of the roads is also an element of culture, as it is a presence of sewage. Clean streets. And with this, Baku is in full order. Even the fences are fascinating! The Gabala high-mountain resort begins with an excellent access road and a cascade water boulevard, which is nice to watch from a bird's-eye view. Three cable car segments with observation platforms, a five-star hotel, a mountain village. Ten Manats (Azerbaijani currency) and you are on the hill. Nothing to complain about, everything is up to five balls. Throwing back my head, I watch paragliders circling over the gorge, announcing the neighborhood with a joyful cry. You can envy their courage and insolence. In the city of Ismayilli there is a pointer to Ivanovka. A very remarkable village of local Molokans (Dukhobors). They have lived here for 200 years in peace and harmony with the local population because they do not steal, do not eat pork and sausage, honor the commandments and, oddly enough, kept the collective farm, club, school. “Spiritual Christianity” is that the Molokans deny rites and ecclesiastical ordinances, like most other Protestants. In prayers and in the performance of religious demands, they do not resort to external attributes; they do not recognize holy places, the church hierarchy, or the priesthood. They do not even put candles in front of icons that they don’t have at all. They have prayer houses without ornaments and bell towers. During the time of Ivan the Terrible, such apostates were executed. Even later, such apostates were in every way oppressed. So they wandered off to different ways. Three thousand people, the largest community in the world, preserved their language and faith. The community has its own wine brand "Ivanovka", which may well compete with Georgian wine. A bottle of such a wonderful exclusive wine costs 6 Manat or 220 rubles. The President of Azerbaijan regularly visits the Russian village and fulfilled the requests of the ethnic Molokans. Like all villagers, they have a hard time living: they sell milk for five rubles each, and a bottle of soda costs ten, and the price of the rest goods is not comparable with the price of agricultural products. As it is in Russia. That's just diesel fuel in Azerbaijan for some reason cheaper than twice even at Lukoil! In Baku, on the square in front of the water sports palace, there is one of the first rockers, a sort of open-air museum, which is the Nou Xau of the 19th century. Here they honor the memory of Russian engineers who have put their brains and hands on it. Academician Mendeleev, who proposed a method for producing fuel from crude oil, is also honored here. In the square, there is a monument to Pushkin and fresh carnations, Lermontov Street, and the guide will certainly remind you of how Yesenin was greeted here. Here they remember that the ashes of the poet Nizami were transferred to this land and buried by Griboedov. I dug around a couple of tea roses bushes near the Nizami mausoleum, talked to a gardener who had lived in Ulyanovsk for five years, worked at a car factory and seemed to be sincerely glad to communicate. Our next destination with Umud Mirzayev was to Ganja, the former Kirovobad, where the ethnic massacre took place. At the entrance to the city, there is a chain of high-rise buildings, which were built for refugees from Nagorno-Karabakh. It is more than thirty years that the tension between the two nations periodically decreases and escalates. Today, Ganja is a “city of treasures”, which fully justifies its name. Cozy, very cute, where there are no bulks of glass and concrete, but where there is the most magnificent Khan Bagha park, built in the 18th century, Sheikh Baheddin, the tomb of Jawad Khan, who died with his son, reflecting the storming of Russian troops. There is a temple of Alexander Nevsky with unique East Asian motifs in the decor. I was particularly surprised by the newsstand in Ganja, completely filled with magazines in Russian. Next, to Ganja, the famous naftalan sanatorium with a museum of crutches and reeds left behind as useless. - In Azerbaijan, there are more than one hundred thousand Russians, and in Armenia, even ten will not be found. But why did Russia turn away from Azerbaijan? - asks Umud Mirzayev with sincere bewilderment. He is originally from Nagorno-Karabakh, and this is the most painful issue for him. And I have nothing to answer to my friend. Me, who used to live among the Tatars, I am pleased to plunge into the local speech with endless "Yakshi, Saol, Salam ...". Forgotten Turkic words pop up. I can find the common language even with Chukchi, even with Bedouin, and I cannot understand why the politicians bleed us among themselves, by dividing into “clean and unclean”? We will share our impressions about an unusual trip to Azerbaijan when we drink wonderful long leaf tea from Nakhchivan from the crystal pear-shaped cups.